The 5th Annual Meeting of the Pennsylvania Rheumatology Society was held September 22-23, 2018, at the Sheraton Harrisburg/Hershey. Over 110 physician and non-physician, rheumatic health providers attended the event which spanned two days and featured nine well known speakers, an interactive Thieves’ Market, 24 poster displays, and a legislative update from the ACR. 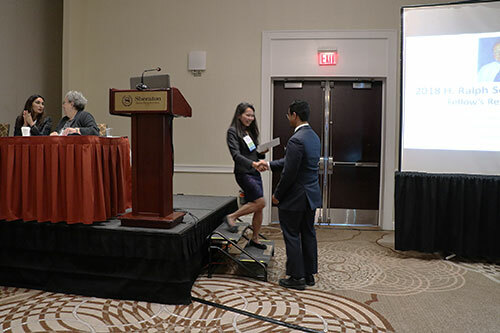 Ralph Schumacher, Jr., MD, Fellows' Research Award winner, Jevon Fragoso, is congratulated by Dr. Irene Tan during the 2018 meeting.